Ice-cream Making Workshop at Tom’s Palette + K-Palette Limited Edition Eyeliner! i must admit it: i’m a horrible cook! the only thing i can cook without messing the kitchen up is instant noodles. hahahaha. but i’m pretty damn good at cooking instant noodles okay! it’s an art. anyway, i had the chance to attend an ice cream making workshop at Tom’s Palette together with Fel, and i jumped at the opportunity!!! who doesn’t love ice cream??? and i didn’t know that making ice cream could be so simple, even a noob like me can do it! Fel came over to my place first, then we cabbed down to Shaw Leisure Gallery, where Tom’s Palette is located! i’ve heard of Tom’s Palette and their homemade ice cream quite a few times, but never had the chance to try their ice cream, so i was really excited to be there for the workshop! so we had a demonstration by the experienced staff on how we should go about making our ice cream, before we jumped right in and started making our own, we all had work stations and ingredients all prepared for us already! and courtesy of Tom’s Palette, i’ll be sharing the recipe for making easy home made Horlicks ice cream that you can even try yourself at home… read on!!! i ended up buying a pint of the Salted Egg Yolk flavor together with Granny’s Favorite! which is cookie dough with chocolate ice cream if i remember correctly. the two of them make such an awesome combination! i know Salted Egg Yolk ice cream sounds kinda weird, but it’s REALLY nice!!! Tom’s Palette has been featured in so many publications before! Fel and I are happy campers! after the ice cream making workshop, we went for a food tasting lunch at Oversea Restaurant at Shaw Leisure Gallery again (i LOVE that place!!!) but i’ll post that up in a separate entry soon! too many pictures. hahah. ice cream followed by the best lunch ever. what a perfect Saturday! Fel and i enjoying our Horlicks ice cream! multiplied the ingredients x 3 so that i could make a bigger portion instead 😀 and i tried it with Milo powder.. just as yummy!! *try to use full cream milk and not low fat milk cos it will affect the consistency/creaminess of the final product! *it’s whipping cream, not whipped cream, so don’t buy the wrong one! whipping cream is a thick cream in a carton form! *when heating the milk, just allow it to steam lightly, and then stir in the Horlicks powder! *let the mixture cool down for about half an hour before freezing it, cos you don’t wanna spoil your freezer by putting hot stuff in it! *leave the whisk in the mixture when setting it to freeze! so that you can use the whisk to churn the ice cream more easily afterwards 😀 it took my mixture at home about 3 hours to really freeze into a nice creamy consistency! do check in every hour and give it a churn to keep the ice cream softer! *the ice cream will keep for about 3 months without any preservatives, so you don’t have to worry about it spoiling fast! HAPPY ICE CREAM MAKING, leave a comment if you have any questions or inquiries about the recipe/steps! and other than Tom’s Palette, guess what. 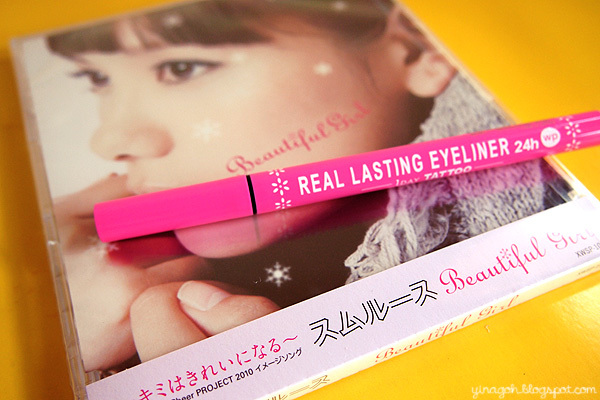 my favorite K-Palette eyeliner now comes in this super super chio BRIGHT PINK packaging that’s limited edition, especially for Christmas!!! the pink packaging is specially designed by a Japanese model, Shiho Takechi, and it even comes with a Bonus Music CD containing K- Palette’s image song “Beautiful Girl”, sung by Japanese band, Thmlues! so cute, only the Japanese would come up with something like this! this is Shiho Takechi, she’s so pretty and doll like!! and you can watch the promotion video for K-Palette X Shiho Takechi here! now i won’t have any trouble locating my eyeliner inside my makeup pouch anymore. it’s so bright and pink i can spot it immediately! my look with K-Palette Super Black Eyeliner, this is really my holy grail eyeliner that’s so easy to apply, and even easier to cleanse off! love it so much! 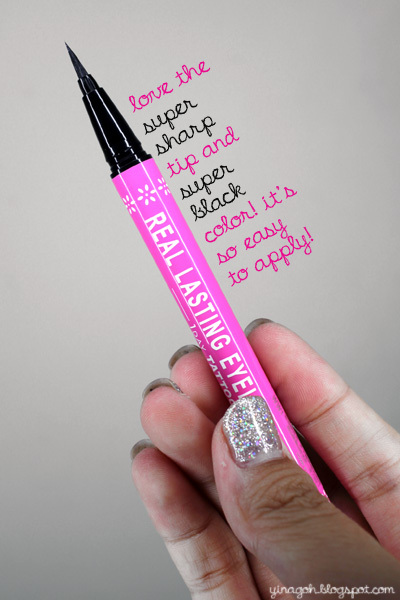 K-Palette limited edition Super Black Eyeliner (Waterproof) in Pink exclusively available at Sasa, retailing at SGD20.90! randomly, i just bought (yet) another lens for my Olympus E-P3, and it’s the 45mm 1.8 prime lens, which is pretty darn good for taking portraits… it’s mid telephoto though so i’m not sure how much i’d use it.. but for the price ($430 from Alan Photo) it’s definitely a good buy! and my test subject.. always my fat chihuahua cos she just lies there….. and does nothing! she’s the perfect test subject! hahahaha. awesome depth of feel and bokeh from the lens. she is SO fat but SO cute. i know you love her too. OKAY. this entry is getting way too long. update again real soon! i’m so excited cos i’m going on Spongbob at Sea with Star Cruises tomorrow night LOL YAYYY WHO LIVES IN A PINEAPPLE UNDER THE SEA??? SPONGBOB SQUUUUARE PANTS!!!!!!!! do go and try the ice cream recipe and tell me how you fared with it!!! have fuuuunnnn!!! Next Post Lancôme Visionnaire + Lancôme Beauty Institute!